Since its debut in 2000, the da Vinci Surgical System (dVSS) has left a lasting impression in the medical world. Used in 4 out of 5 radical prostatectomies in the US [source: Intuitive Surgical], the system is the leading tool for minimally invasive surgery. The surgery isn’t limited to the prostate region. According to Intuitive Surgical Inc., the company that invented the dVSS, over 1.5 million surgeries have been completed with the assistance of the dVSS. These include gastrointestinal surgery, trans-oral surgery, gynecological surgery, and urological surgery. Loma Linda University is an avid advocate of the dVSS and their medical staff isn’t standing by idly either. Doctors like Duane Baldwin are trying to revolutionize surgeries in areas like nephrology with the assistance of da Vinci. 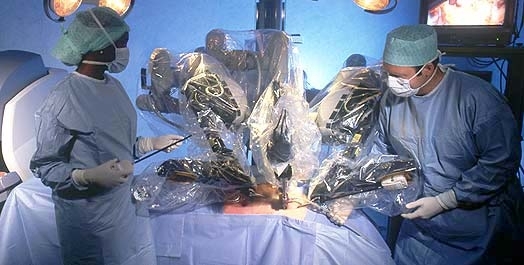 How Helpful is da Vinci Robot Surgery? Just How Helpful is the da Vinci Robot? Using the da Vinci Surgical System reduces the time under the knife and increases the doctors’ precision while decreasing the size of the incisions, minimizing the amount of scarring typically experienced after a traditional laparoscopic surgery or open surgery. In addition, the patients experience less pain and blood loss and require less recovery time at the hospital [source: Loma Linda University], thus reducing the price of postoperative costs (hospital bills, painkillers, transfusions, etc.). After detailing so much about da Vinci's capabilities, an obvious question is formed in the minds of those reading. What are the thoughts of the doctors using dVSS? Are they worried that robots will make them obsolete? Are they scared that they will take away their jobs? The doctors at Loma Linda Hospital, in Loma Linda, California certainly aren't worried. Since it's initial use in 2004, the da Vinci Surgery System has been widely praised by the doctors who have used it. Dr. Duane Baldwin uses his experience with the dVSS to push the boundaries of kidney surgery. Dr. Kevin Balli saw potential in using the machine for gynecologic purposes and began to offer such services in 2005. Dr. Marcos Michelotti believes that patients deserve the most innovative procedures possible, and using da Vinci is certainly a way to make that happen. At least 14 highly accredited doctors at Loma Linda are using this technology for the benefit of the patients, including the ones previously stated by Loma Linda Doctors who use da Vinci ]. Now that we know about the doctors' thoughts, what about those who go on the operating table? The results of da Vinci robot surgery, laparoscopic specifically, were reviewed favorable by many patients who underwent the surgery. Thanks to the da Vinci Surgical System, women like Cheryl Seichs can still enjoy exercise and a more physically demanding lifestyle after hysterectomies and other gynecologic procedures. When Mark Hernandez found out he had prostate cancer, he knew that incontinence and erectile dysfunction weren't postoperative symptoms he could live with, so he turned to da Vinci. After the surgery he is now cancer-free and can live without the dilemmas that plague men after the traditional surgery [source: Loma Linda].